Mount Karisimbi is an inactive volcano in the Virunga Mountains on the border between Rwanda and the Democratic Republic of Congo. At 4,507 metres (14,787 ft), Karisimbi is the highest of the eight major mountains of the mountain range, which is a part of Albertine Rift, the western branch of the East African Rift. Karisimbi is flanked by Mikeno to the north, Bisoke to the east and Nyiragongo to the west, on the other side of the Rift Valley. 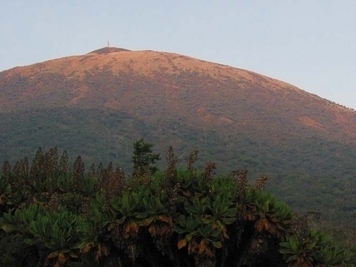 Karisimbi is the 11th highest mountain of Africa. The name Karisimbi comes from the word 'amasimbi' in the local language, Kinyarwanda, which means snow. Snow can mostly be found during the dry season in June, July and August on the top of the volcano. Between Karisimbi and Bisoke is the Karisoke Research Center, which was founded by Dian Fossey in order to observe the mountain gorillas living in this area. Here's the our members favorite photos of "Volcanoes near Virunga Mountains". Upload your photo of Mount Karisimbi!